Zoosk is an online dating app and a market leader in mobile dating, available in over 80 countries and over 25 languages; Zoosk specializes in helping singles across the globe find the right person for them by providing personalized dating experience using latest technology. With a membership of over 35 million, Zoosk is among the largest online dating platform. 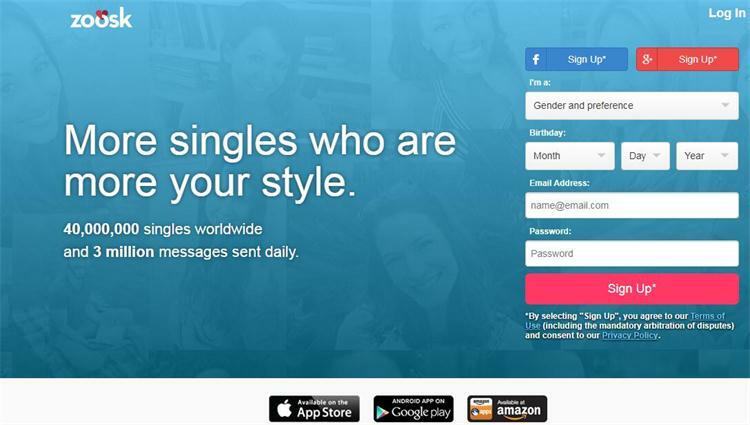 Signing up with Zoosk is similar to other online dating platforms. However, with Zoosk you have the alternative of signing up with either Facebook, Google+ or via email. As with every other online dating platform, the first step involves providing information about your gender, the gender of your potential match, email address, password and date of birth. After the SignUp, you’ll begin a short 3-step registration process that requires that you enter your location, in the form of a zip code, upload/import images, enter your ethnicity, body type, height, education, and parental obligations (if any). Depending on your preference, you can filter your match searches into details such as their city/area of residence. This feature makes available a number of compatibility queries that facilitates your chances of connecting with similar-minded members. It is advisable that new members fill the correct information while signing up on the platform as this information plays a key role in determining what sort of person you’ll be matched with. Zoosk provides its members with a single match suggestion daily based on information provided and Behavioral Matchmaking engine; however, you are not obliged to accept the match, you also have an option of rejecting a match. The Zoosk app (available on all major app stores) lets you connect with other members on the go. This feature lets members boost their profiles helping them become more visible and hence attracting attention and interest to his/her profile. If you are curious about your dating style, then this is the place to go, here you will find helpful information about your dating patterns. Zoosk’s appeal is in its simplistic approach to matching members. Members don’t have to spend hours providing answers to long questionnaires. The user-friendly design and interface ensures that members do not need to play around with the site for days to understand how it works. The site and app feature clutter free spaces that attractively display member profiles one at a time, whatever activity you are undertaking such as browsing who’s online, or searching through profiles. This ensures that there’ll be only one person you are viewing at any one time. Additionally, you also have the option of going back and forth between profiles. Zoosk.com is an innovative site that employs the use of advanced technology such as its Behavioral Matchmaking engine to filter searches based on characteristics and features you find appealing. Its use and integration with social media accounts opens up different avenues of engaging and interacting with fellow members. With a membership of over 35 million Zoosk is quickly becoming the most talked about online dating app and platform. With all its exciting features, Zoosk is continuously evolving its offering to meet the ever-changing demands of a dynamic online dating space.